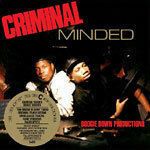 Traffic Entertainment Group and B-Boy Records are proud to present one of the most influential and original hip hop albums in music history by none other than the BDP for 1987's Criminal Minded. The combination of the legendary KRS-One, the late DJ Scott La Rock (who was murdered just months after the album's release) and D-nice, brought forth a hard hitting street-wise album backed by an intelligent, politically and socially conscious approach to the lyrics over the minimal and simplistic beats of the time. Elevating the standards and proving that rap could be a dynamic and consciousness-raising medium, as the album touched on life in the South Bronx, paving the way for what some would call the official arrival of gangsta rap. The much anticipated, double-disc deluxe edition features the original ten tracks off of the album and is enhanced with the ultra rare video for the ''The Bridge Is Over'' with all cuts remastered from the original recordings. The second disc contains rare 12'' cuts and alternative versions as well as previously unreleased radio spots and audio footage. Also within the new packaging there is never before seen artwork packed with original illustrations by KRS-One himself, vintage BDP promotional material, unreleased photography, full lyric sheets, and in depth liner notes. A must have for collectors and a must listen for first timers!